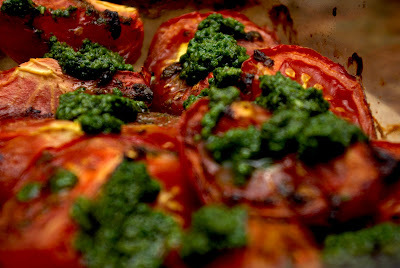 Succulent, sweet and slightly acidic all at the same time, fresh tomatoes are an amazing thing. Unfortunately, they are available for about 45 minutes here in Canada when summer ends and fall begins. The rest of the year our tomatoes resemble granny smith apples in colour and texture so that they may survive the trip north to our frozen land. The result is something that looks like a tomato, bounces like a lacrosse ball, tastes like plywood and is best used as a projectile weapon to deter burglars. If, however, you roast these woody little spheres, they come close resembling actual tomatoes and are quite delicious, giving you the illusion of it being late August instead of late January. Preheat oven to 375F. Cut the tomatoes into quarters, removing the woody white roots of the stem. Toss to coat in olive oil and balsamic and sprinkle with salt and pepper. Roast in the oven until the tomatoes start to break down and caramelize, about 30-40 minutes. Remove from oven, top with pesto and serve.